Originally released in 1993, Tim Burton’s The Nightmare Before Christmas has become something of a classic. 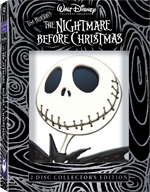 A new DVD has eye-catching packaging with a three-dimensional, molded plastic Jack Skellington on the front of the box. Inside the case are two discs of content and a third disc for making a digital copy. For anyone who just wants to see the movie, this may seem like overkill. But even if you’re not interested in the extras, the movie is worth a look. In the early 1980s, Tim Burton, then working as an animator for Disney, saw a Halloween display in a store window being replaced with a Christmas display. He wrote a poem about Halloween characters invading Christmas, drew some sketches, and pitched the idea to his bosses, who declined to make it into a movie. Some years later, Burton, now a highly successful film director (Batman, Edward Scissorhands), came back to Disney with his old idea. This time they were more interested. Although Burton’s name is in the title, the movie was actually directed by veteran stop-motion animator Henry Selick (Burton was busy directing Batman Returns). Burton was very much involved in designing the look and feel of the movie. The Nightmare before Christmas is infused with his darker sensibilities. The movie imagines a world where the icons of holidays have their own towns. Halloween Town is populated with all manner of monsters, vampires, mad scientists and creepy creatures. The leading citizen is Jack Skellington, a skeleton-man in a pin-striped suit. Another Halloween has successfully come and gone, but Jack’s feeling a little blue. Surely there’s more to life than scaring people. And then he stumbles into Christmas Town. Jack is thoroughly delighted with the holiday, though mostly clueless about how this Christmas thing actually works. He gets some Halloween denizens to kidnap “Sandy Claws,” so that Jack might take his place, delivering shrunken heads and toy ducks with bloody bullet holes to the unsuspecting kids of the real world. The story, though original, is thin at times. According to the commentary track, there wasn’t even a script when shooting began, just the story and some songs written by Danny Elfman. What Nightmare lacks in plot, it makes up for in looks. The movie is bursting with imaginative visual details, from the vampires playing hockey with a jack o’lantern to the man-eating Christmas wreaths. Jack himself is quite an achievement on the part of the animators, who turn this stick figure without a real face into an expressive character. The best feature on disc one is a 25-minute making-of documentary. It spends very little time with fawning talking heads and instead concentrates on the painstaking logistics of making a feature-length stop-motion film. It took the animators one week to shoot one minute of film, and three years to complete the whole thing. On the commentary track Burton, Elfman and Selick have plenty to say, and seldom repeat themselves. “Jack’s Haunted Mansion Holiday Tour” is a seven-minute tour through Disneyland’s Haunted Mansion ride, transformed into a Nightmare Before Christmas theme. “Off Track,” is a 36-minute featurette on the creation of the ride. Also on this disc is Burton’s poem, which he wrote when he was working on the story. It’s read by Christopher Lee and illustrated with concept sketches. Disc two starts out with two short films directed by Burton when he worked for Disney. Frankenweenie (1984) is a 30-minute long live-action short. Young Victor Frankenstein is a 10-year-old Southern Californian who loses his beloved dog. A demonstration of electricity on the nervous system of a dead frog gives him unnatural ideas. Vincent (1982) is a five-minute stop-motion short about a young boy who wants to be like his favorite movie star, Vincent Price. Price himself narrates. Burton’s distinctive visual style is evident in both movies, particularly Vincent. The rest of the features on disc two highlight the look of the movie, with a four-minute storyboard-to-film comparison and extensive galleries of concept art. Seven deleted scenes (including one featuring the severed head of Burton) are accompanied with voice-overs by Selick. Finally, the disc has a poster gallery and two trailers. You’re only allowed to use the special code once, and you must use it within a year of the DVD’s release (there goes the second-hand market). You can’t give the copy to someone else. If you don’t have internet access, you can’t use the code. You also must have the “latest version” of Windows Media Player, and it won’t work on Windows 2000; only on XP or newer. The movie is presented in 1.66:1 widescreen and has a crisp, clear picture. The box boasts that the movie has been digitally restored and remastered. The 5.1 Dolby Digital surround sound is put to good use. Make sure to transfer the movie to your computer pretty soon if you’re going to do it, because your code will expire in a year. Watch the movie. At your leisure, check out the making-of documentary and the shorts on disc two. The rest of the features are for serious fans of the movie. The Haunted Mansion features are for Disneyland Fans only.